Attendees who stopped by the Quanser Booth at last month’s ASEE 2012 Conference in San Antonio, Texas not only saw our workstations on display—they got a chance to fill in a ballot, learn about the new, upcoming Engineering Community website that Quanser is sponsoring, and win a Kobo VOX eReader. 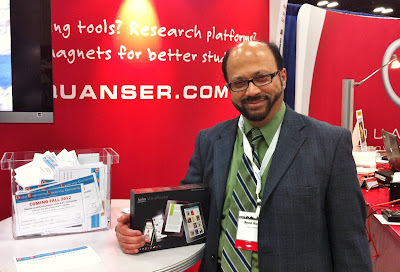 The lucky winner of this remarkable eReader is Syed Rashree, of DeVry University. Congratulations, Syed! Syed Rashree of DeVry University. Congratulations to Syed! Quanser’s Global Engineering Leadership Community website will be coming online later this fall. By joining this community, you’ll be a winner as well. That’s because you’ll enjoy significant opportunities to exchange information and collaborate with peers around the globe. We hope it will also help you discover new ways to support and grow your professional interests. We’ll tell you more in the coming months. For now, stay tuned to this blog and look for your opportunity to tour this new online community site focused on advancing engineering education and research.